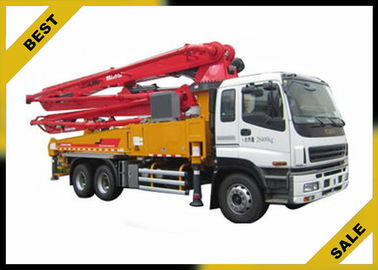 Boom Section Boom folding type "R"
Stabilizer Stabilizer opening width of outriggers (m) "I"
Chassis according to customer requirements, pumps can be mounted on 6x4 chassis from Europe, Japan or chinese manufactures. The press of a button brings the boom to a smooth and immediate stop. Advanced technology to increase overall efficiency and reduce operator fatigue. Minimizes chatter during pumping, to allow steady delivery. Rotary braking delivers precise swing operations. Improved service life and reduced operating cost. Features such as boom overload protection and hydraulic oil level monitoring are used to prevent damage. Increased pumping efficiency equals reduced fuel consumption. Q: How long is the warranty period ? A: We offer 12 months warranty for the machine (main body) from the date of installation finished. A: one set is aviliable. Q: What's the payment method ? A: We accept L/C, T/T payment. A: According to the model and quantity, generally within 15days for one set. Q: Can I have our LOGO on the machine ? A: Of course you can.